If it's happening, it's here. Check out all the latest IPT UK news and updates from across the country. NICE have changed the publication date of the update to their 'Depression in adults' guideline to February 2020, and have added in an additional consultation period between 2nd October - 13th November 2019. For more updates, please click here. You can download the Stakeholder Position Statement (March 2019) by clicking here. The IAPT Manual has been published! Please click here to view the manual, and its appendices and helpful resources. You can also follow the NHS blog posts by clicking here. Please click here to view the article, and click here to view the policy paper. Please see the update from NICE below. You can view the published responses by clicking here, and the final scope for the update by clicking here. As you will be aware, we recently ran the second election for the Research Lead post, which sits on the IPT UK Executive Committee. We are delighted to say that the number of votes cast during this election re-run increased by 15% from the first run. For this we would like to say a huge thank you to everyone that took the time to vote again, as well as to those who took the opportunity to vote this time having missed their chance the first time round. Now that the election is closed, we are pleased to announce that Paul Wilkinson and Fiona Duffy have been successful in their bid to run as a team. Paul and Fiona received 78% of the votes, 50% more votes than any individual or combined set of nominees received last time, and only 8 votes fewer than the number cast in total across all candidates last time! We are sure you will join us in offering our congratulations to them both. Paul and Fiona will now join the Executive Committee as joint IPT UK Research Leads. As an organisation, we are very much looking forward to working with Paul and Fiona on developing the place of research in IPT UK. 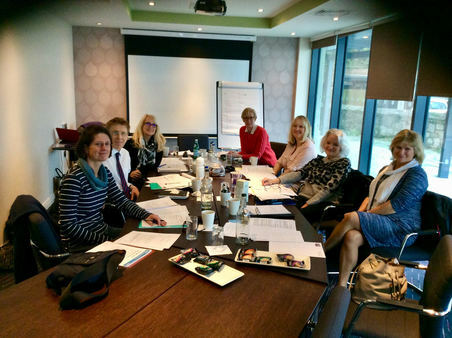 Welcome to the newest recruits on the IPT Practitioner training course based in Leeds (see image below)! Congratulations to the current cohort of CYP IAPT IPT-A students on the London and South East course, who had their final meeting on 26th November 2018 (see image below)! ​Please click here to download the article. Please scroll through the slideshow below to view some photos from this very successful CPD day! Please click here to view a presentation which details all IPT Manuals available in English to date. Please click here to go to our Policies section, where you can download our revised Privacy Statement. The IAPT Manual has now been published! Please click here to view the manual, and click here to view the manual's appendices and helpful resources. You can also follow the blog posts by clicking here. Rally Round is a free and secure online tool that allows family members, friends and carers to organise support for someone they care about. Please click here to view the resource. We are very pleased to announce that Dr Roslyn Law's book, "Defeating Depression: How to use the people in your life to open the door to recovery" is now on library shelves across England. Please click here for more information. Congratulations, Ros! BBC Radio 4 are broadcasting a three-part series, beginning on 12th June, entitled "Storm and Stress: New Ways of Looking at Adolescent Mental Health". Click here to listen online. Journal Article: Anti-depressants might work for people with major depression: Where do we go from here? You may have heard about the new General Data Protection Regulation ("GDPR"), that comes into effect on 25th May 2018. To help comply with GDPR consent requirements, IPT UK need to confirm that you would still like to receive information from us about upcoming events, useful articles and membership surveys. We rely on being able to contact you through our newsletters to market our national CPD events and to ask for your input on how you want IPT UK to work for you. We hope that our newsletters are useful to you. If you would like to continue hearing from us, please update your subscription settings before 25th May 2018. Please note that if you do not opt in to hearing from us for marketing purposes, we may still contact you about important changes to your membership whilst you remain an accredited member of IPT UK. 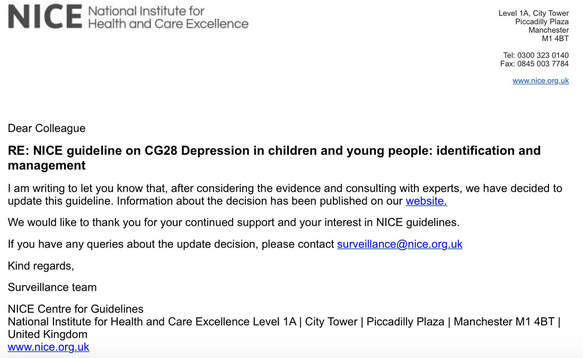 As your organisation is a registered stakeholder for NICE’s update of its depression in adults guideline, I am writing to advise that NICE has decided to run an exceptional second consultation on the guideline. This will start next Tuesday, 15th May. The deadline for comments will be 5pm on 12th June. The consultation documents will include revised versions of the short and long versions of the guideline and a table of all comments received in the first consultation, together with NICE’s responses. NICE is running this exceptional second consultation so that, before final publication, stakeholders can see how their previous comments have been dealt with and to provide an additional opportunity to comment. Responses to second round consultation comments will be published with the final guideline. Tang, T-C, Jou, S-H, Ko, C-H, Huang, S-Y, & Yen, C-F. (2009). Randomized study of school-based intensive interpersonal psychotherapy for depressed adolescents with suicidal risk and parasuicide behaviors. Psychiatry and Clinical Neurosciences, 63, 463-470. Heisel, M. J., Duberstein, P. R., Talbot, N. L., King, D. A., & Tu, X. M. (2009). Adapting Interpersonal Psychotherapy for Older Adults at Risk for Suicide: Preliminary Findings. Professional Psychology, Research and Practice, 40(2), 156–164. A 2014 Canadian Broadcasting Corporation (CBC) interview of psychologist John Cacioppo by Michael Enright. Cacioppo was the director of the University of Chicago's Center for Cognitive and Social Neuroscience and wrote on loneliness. Schaefer, J. D., Caspi, A., Belsky, D. W., Harrington, H., Houts, R., Horwood, L. J., … Moffitt, T. E. (2017). Enduring mental health: Prevalence and prediction. Journal of Abnormal Psychology, 126(2), 212–224. Mychailyszyn, M. P., & Elson, D. M. (2018). Working through the blues: A meta-analysis on Interpersonal Psychotherapy for depressed adolescents (IPT-A). Children and Youth Services Review, 87, 123-129. "Have you ever heard of the Harvard study that ran for 75 years to assess what makes us happy? It’s a revolutionary study in psychology. It followed the lives of two groups of men for over 75 years, and it now follows their Baby Boomer children to understand how childhood experience reaches across decades to affect health and wellbeing in middle age. So what keeps us happy and healthy as we go through life? If you think it’s fame and money, you’re not alone – but, according to psychiatrist Robert Waldinger, you’re mistaken. As the director of a 75-year-old study on adult development, Waldinger has unprecedented access to data on true happiness and satisfaction and he lays it all bare in the Ted talk below. Specifically, the study showed that having someone you can rely upon helps your nervous systems relax, helps your brain stay healthy and reduces emotional pain. The data also clearly found that those who feel lonely are more likely to see their physical health decline earlier and die younger. It doesn’t matter whether you have a huge group friends, or if you’re in the perfect romantic relationship, it’s the quality of the relationships that counts – how much depth and honesty exists within them; the extent to which you can relax and be seen for who you truly are. This a very good reminder to prioritize authentic connection with others. Because the data is clear that, in the end, you could all have the money you’ve ever wanted, but without loving relationships, you won’t be happy." This is to advise you that NICE will not be publishing the depression in adults update on 21st March 2018 as planned. The publication date has been changed to ‘to be confirmed.’ As soon as a new publication date is available, you will be advised. This is advance notice that the NICE eating disorders quality standard consultation will run from 12th March 2018 to 9th April 2018. We would very much welcome your comments on the draft quality standard. Please note that this is the second consultation because of substantial changes after the post-consultation quality standard advisory committee. At the first consultation we asked whether access to services should be included as a key area for quality improvement. 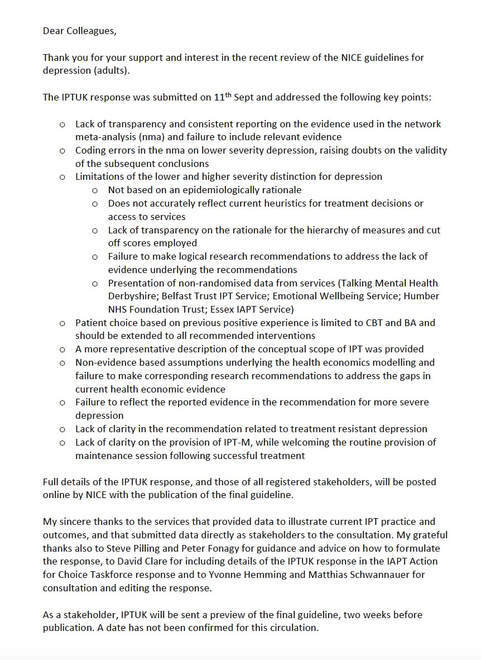 This received general stakeholder support and also coincided with the Parliamentary and Health Service Ombudsman report (December 2017) on ‘Ignoring the alarms: How NHS eating disorder services are failing patients’ which recommended NICE include coordination of care within the quality standard. As a result, two new quality statements have now been included on access to services and coordination of care. Registered stakeholders will be notified on the day the consultation opens with instructions on how to submit comments. We encourage you to register as a stakeholder. Comments received from non-registered organisations and individuals are not summarised in the summary report presented to the committee but are included as an appendix. These comments are not made available on the NICE website. However, if they result in changes to the quality standard this is recorded in the committee meeting minutes. Please click here to view further details for our next Network Meeting, to be held on Friday 11th May 2018. We would be grateful if you could complete the RSVP form to inform us of your attendance in advance - just follow the link above and scroll down to the bottom of the page. Chris Freeman was a visionary psychiatrist, who transformed the way many people deliver and receive evidence-based therapies across Scotland, the UK and far beyond, through his commitment to training, service innovation and research. As one part of his multi-faceted career, he was instrumental in bringing IPT to the UK. Long before most clinicians in the UK knew what IPT was, and certainly before it was routinely available in the NHS, Chris led a research trial to compare IPT, CBT and Usual Care for depression and anxiety in primary care. True of so many of his projects, he had a vision of more choice and better access for the people who received the treatments under scrutiny. Not satisfied with running a local research trial, Chris, being Chris, followed this up by hosting the first national conference on IPT in the UK and was instrumental in establishing the special interest group, which became IPTUK. 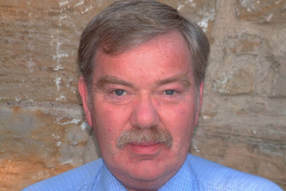 He devised a unique contribution to a national programme of service transformation in Scotland, Doing Well by People with Depression, which implemented a model of IPT training delivered across eleven sites in Scotland, with the aim of establishing self-sustaining hubs of practice and supervision to ensure effective dissemination of IPT around the country. It is not difficult to see how far ahead of his time he was when we consider that this programme was in place almost ten years before IPT took up its place in IAPT, with many of the same objectives across England. Chris’s vision was not limited to the UK and, over many years, he was also a central figure in the early meeting of ISIPT, following the APA across the US on an annual basis for one-day meetings in which many of the topics we still grapple with today were the subject of discussion and debate. Reminiscent of the most influential thinkers behind IPT, Chris was a maverick and truly independent thinker. He challenged accepted wisdom and focused on making the best evidence-based therapies of the time accessible as widely as possible. He was an expert in CBT and established a programme of multi-disciplinary training, which became the South of Scotland CBT course. IPT was fortunate to become a focus for this visionary drive for accessible, effective and evidence based therapy. I have a very personal reason to be grateful and deeply saddened by his loss. Chris is, without doubt, the colleague and boss who made me the psychologist I am today and who brought IPT into my professional life. Chris had a tremendous gift for seeing potential in people – colleagues and patients alike – and he frequently saw more than the person could see in themselves. I remember with great fondness the informal interview I had with Chris, in the pub, before he recruited me to the Primary Care trial. I answered, “No,” to almost every question he asked and, fortunately, he paid no attention and hired me anyway. Over the next ten years we worked together to establish the IPT Scotland course and the IPTUK network. Chris was supportive with a skilfully light touch, inspiring so many people around him to do and be more than they imagined they could before meeting him. It is with great sadness and gratitude that we now say goodbye. ​Thank you to trainer and supervisor, Dr Elizabeth Robinson, who facilitated the Supervisors’ Update in the South West region, and to Hazel Maxwell-Payne who organised the day in Exmouth. Journal Article: "Interpersonal Psychotherapy for eating disorders with co-morbid depression: A pilot study"
Although it is a small study, with a very small sample and no control group, as far as we know it is the only one about depression-focused IPT and co-morbid ED. We hope that some of you will find it interesting. 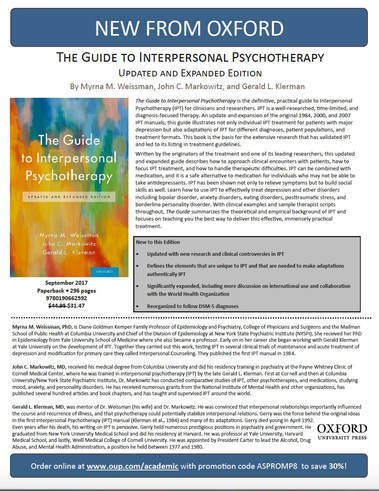 The updated and expanded edition of The Guide to Interpersonal Psychotherapy is now available to purchase here. Order using the promo code ASPROMP8 to save 30%! Please click here to download Dr Roslyn Law's update regarding our recent submission to NICE in response to their consultation on the draft guidelines for depression (adults). 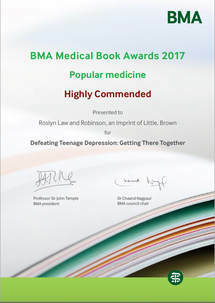 ​Dr Roslyn Law, Chair of IPT UK, has been awarded Highly Commended for her book, 'Defeating Teenage Depression: Getting There Together', as well as for 'Medical Psychotherapy', to which she has contributed, at this year's BMA Medical Book Awards. Congratulations, Ros! Article: Depression - Do you know all your r's? Article: What happens to the brain as we age? In “Treating Anxiety in 2017”, Drs. Stein and Craske outline management of anxiety treatment for non-psychiatric clinicians.1 They strongly endorse pharmacotherapy and cognitive behavioral therapy (CBT) “by a qualified therapist,” both of which are evidence-based anxiolytic treatments. They further emphasize that “not all therapy or counseling is CBT,” as if to warn the non-psychiatrist against referring patients to Brand X talking therapies. We are looking for experts on Eating Disorders to join our Quality Standards Advisory Committee (QSAC) to develop a quality standard. The role is for a mental health nurse. Information on the post is available on the NICE website, please follow this link for details. The deadline for applications is 8 August at 17.00. NICE quality standards are derived from high quality guidance such as that from NICE or other sources accredited by NICE. Quality standards are developed independently by NICE, in collaboration with healthcare professionals and public health and social care practitioners, their partners and service users. Information on priority areas, people's experience of using services, safety issues, equality and cost impact are also considered during the development process. Health professionals and public health and social care practitioners to make decisions about care based on the latest evidence and best practice. People receiving health and social care services, their families and carers and the public to find information about the quality of services and care they should expect from their health and social care provider. Service providers to quickly and easily examine the performance of their organisation and assess improvement in standards of care they provide. Commissioners to be confident that the services they are purchasing are high quality and cost effective and focused on driving up quality. Article: Is an increase in individualism damaging our mental health? As many of you will already know, the NICE guidelines on ‘Depression in adults: Treatment and management’, is under review. The consultation period, during which stakeholders are invited to comment on the draft guidelines, opened on 18th July 2017 and will remain open until 5th September 2017. The draft guideline has significant implications for the future availability of IPT, with the strength and breadth of the recommendation for IPT being downgraded in the current draft. It is imperative that therapists, service providers and education institutions register as stakeholder and participate in the consultation on the proposed guidelines. IPTUK will prepare and submit a response to the draft as part of the consultation, but IPTUK members should NOT assume that this is sufficient or will have the power to change the guideline. This will rely on the accurate presentation of evidence and strength of the response from practitioners and service providers. We hold a collective responsibility to respond to this draft and shape the next guideline. Consider a selective serotonin reuptake inhibitor (SSRI) or mirtazapine for people with less severe depression who choose not to have psychological interventions, or based on previous treatment history for confirmed depression had a positive response to SSRIs or mirtazapine or had a poor response to psychological interventions. 2. Person with depression and no response or limited response to initial treatment – IPT is considered only after another treatment has failed. If a person with depression has had no response or a limited response to initial treatment (within 3–4 weeks for antidepressant medication or 4–6 weeks for psychological therapy or combined medication and psychological therapy), assess:· whether there are any personal or social factors that might explain why the treatment isn’t working· whether the person has not been adhering to the treatment plan, including any adverse effects of medication. Work with the person to try and address any problems raised. · changing to a combination of 2 different classes of medication, in specialist settings or after consulting a specialist, if the person is on medication only or a combination of medication and psychological therapy and does not want to continue with psychological therapy. · switching to a psychological therapy alone (CBT, BA, or IPT) if the person wants to stop taking medication. These details provide a summary of the proposed revision to the guideline. Please take time to read through the full guideline and rationale for making these changes. IPTUK will publish an up to date record of all stakeholders within our membership. Please confirm that you have signed up to be a stakeholder with contact@iptuk.net to be added to the list. Do #IPT therapists have comments for Ari (pp. 181-185)? Have @ABCTNOW members using new tx's had similar thoughts? ... so some of you might want to chime (or tweet) in. The infographics below were presented at the IPT UK National Network Meeting on 12th May 2017. They provide a nice snapshot of the membership. *Please note that the survey response rate for the second infographic was incredibly low, and thus not a very representative sample. The results are being reviewed by the Executive Committee who have plans to draw up a new survey. A higher member response rate will be required for the next survey to inform any change that takes place to the current set-up of the national meetings. Therapists and group members of an IPT-G Group for Binge Eating Disorder in Gloucestershire were recently interview for the iPM programme on BBC Radio 4. The interview will be broadcast at 5:30 pm on Saturday 27 August. If you are unable to tune in at this time the programme will be available from Sunday here http://www.bbc.co.uk/programmes/b0089nbb. We hope you are able to listen and hear about the fantastic work going on in the field of IPT-G. Thanks go to Julia Fox Clinch, Zoe Hepburn and the team. Following discussions at the IPT UK meeting in November 2013, the decision was made to charge individuals to become members of IPT UK. This has allowed us to create a bespoke members’ area filled with useful resources for IPT trainees, practitioners and supervisors. This includes the latest IPT related news, many resources, from abstracts of the most informative journal articles to presentations from conferences and videos. The members’ area also contains minutes from IPT UK meetings to keep you up to date with the organisation nationally, and any job vacancies currently available. To add to this, we are also offering members the opportunity to promote themselves as IPT practitioners and supervisors under our ‘Find a therapist’ button on the website. We hope that this will prove popular and make life simpler when searching for supervisors or practitioners. Members who select this option will be able to list their geographical region, email and phone number. 1. Trainees - for individuals who have attended their 5 days training and are working towards practitioner status. There will be no charge for trainees to access the members’ area as they complete their preparation to become IPT practitioners. 2. Member Basic - for accredited practitioners and supervisors wishing to access the members’ area. The annual fee for this will be £75. 3. Member Plus - for accredited practitioners and supervisors wishing to promote themselves on the IPT UK website. The annual fee for this will be £100. In order to become a member of IPT UK please complete the form below by clicking on the link. If you would prefer to pay by standing order, please get in touch and we will arrange registration and standing order forms for you to complete. Your membership will not be activated until we have received payment. Once registered you will receive an email with a password to the member’s area of the website. As the administrator only works one day a week this will be sent out within 5 working days of your registration. Please do not share your password with non-members. We will be unable to support the extended facilities without funds generated by membership and our capacity to do so will be undermined if the password is shared without prior agreement. 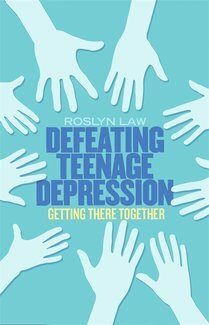 IPT UK is delighted to announce the release of Dr Roslyn Law’s new book, Defeating Teenage Depression – getting there together. The book is an accessible guide to combatting depression for teenagers, using Interpersonal Psychotherapy for Adolescents (IPT-A) and is available from little, brown book group here. This practical guide uses techniques based on Interpersonal Psychotherapy for Adolescents (IPT-A) which has been used to help children and young people with depression around the world. IPT-A helps them to develop their own story of what is happening in their life so that they can understand their depression and how to get out of it. This is Roslyn’s second book, having published the effective Defeating Depression, a practical IPT based self-help book for adults, in 2013. We would like to congratulate Roslyn on this wonderful achievement and wish her latest book every success! The latest IAPT report states that IPT produces the best outcome rates of all the face to face talking therapies. Congratulations to everyone for the fantastic work you are doing every day and this very well deserved recognition.